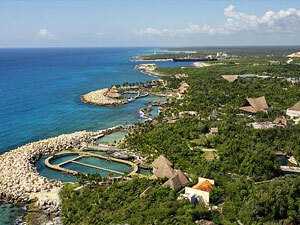 With the Xel-Ha Dolphininclusive Tour you will have it all! All inclusive entrance to Xel-Ha ecological park (Food, drinks, snorkeling equipment, towels, lockers and 30 attractions), a Dolphin Swim to choose between Delphinus Primax and Delphinus Dolphin Ride, round trip transportation from your hotel and as an added bonus a Snorkel with Dolphins Program! Xel-Ha is an incredible natural aquatic park, home a wide variety of colorful tropical fish, you can learn how to snorkel and observe the different species up close. You will explore cenotes (underground caves) or simply sit in one of the beach chairs and soak up the sun along the spectacular coastline! Spend qualified time swimming with dolphins, you will be able to soothingly caress their backs and their belly, to kiss them and be kissed; but what truly stands out from this swim with dolphins program is the Foot Push activity, where dolphins will propel you with all their strength and glide you thru the water! Afterwards, youll be surprised by their impressive jumps just a few foots away from you. This is a program where our guests will have a great time with the dolphins in the water and on a platform. Visitors will swim freely with the dolphins, play with them and as an important part of the program they will also get a big dolphin kiss among other activities. The outstanding part is when you get on a ride around the pool held in our dolphins to enjoy the Dolphin Ride! Special resting area with air conditioning, showers and locker. Activities in the park that have an extra cost. Other services (WiFi, ATMs and shops at additional cost). The lowest height must be at least 3.3 feet (1 mt.) to enjoy this activity. Wearing safety vests during any water program is mandatory. Bring extra cash for souvenirs, photos and video.